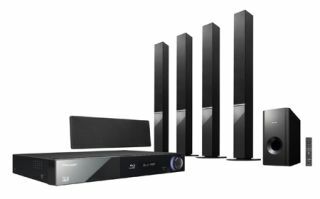 Pioneer unleashes a quartet of Blu-ray home cinema systems | What Hi-Fi? Pioneer has unleashed a quartet of Blu-ray home cinema systems, two with iPod/iPhone connectivity and wi-fi, and two without. The 'regular' range consists of the BCS-717 (£500) and BCS-313 (£400), both with the aforementioned iPhone/iPod and wi-fi capability, while the BCS-414 (£450) and BCS212 (£300) both do without. All four support Full HD and 3D Blu-ray, have a 5.1 speaker configuration, two HDMI sockets, internet video streaming, an FM radio with RDS, and DLNA compatibility. A mini jack audio connector, for portable music players, and a USB connector are also standard across the ranges. The key difference between the BCS-717/BCS-414 and BCS-313/BCS-212 is that the former pair have four tall floorstanding speakers and a subwoofer, while the latter pairing get four compact satellite speakers and a subwoofer. Power output on all models is 5 x 180W, plus 200W for the subwoofer. There's onboard decoding for Dolby TrueHD and DTS-HD Master Audio, support for DivX, DivX HD and MKV video files, and they will play WMA, MP3 and AAC audio.